Here is what I get to enjoy regularly, living on Florida’s west coast. Thought I would share. I found a cool spot where they are building up the beach, so the water kind of bounces back off of the breakers to make the criss-cross waves. I’m actually sitting in the water shooting this video. This sunset followed our last beach volleyball day for the summer. Our team lost in the championship game, so we got second place. Which really gets us nothing, not even bragging rights, but did result in another slight case of heat stroke. It’s gonna be a hot summer! 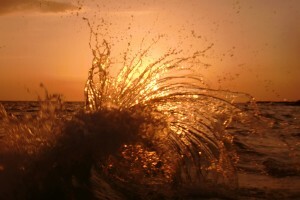 I just love the photo of wave art. Simply amazing. Nice job! Aw, thanks! I kinda dig it, too.